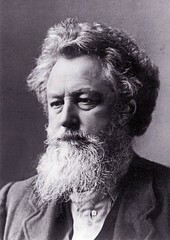 William Morris was an exceptional figure in nineteenth century England. Artist, writer and socialist, he led the arts and crafts movement, pioneered the British socialist movement and was a respected writer of poetry and fiction. Perhaps best known as a designer, his firm Morris & Co. became one of the leading interior decorating businesses of Victorian Britain, enjoying an international reputation and clientele. Disappointed with the mass production of industrial England, Morris insisted on a return to traditional values with the use of hand-crafting, natural materials and thoughtful design. As a fervent socialist he wanted to improve the quality of British life by producing beautiful objects for everyday use, with the intention of raising craft to the status of art. He was interested in all aspects of design and learned many production techniques himself in order to master the processes he subsequently taught to others. Passionate about researching original objects from the past and teaching himself lost crafts, Morris’s knowledge derived from a study of ancient Egyptian, Byzantine, Persian, Indian, Northern European and English traditions. Morris and Co. consistently produced outstanding carpets, wallpapers, tapestries, ceramics, embroideries, furniture and textiles. Late in his life, Morris fulfilled his passion of publishing finely printed books with the establishment of his Kelmscott Press in 1891, which set new standards for high-quality book production and encouraged the establishment of the private press movement in Britain.